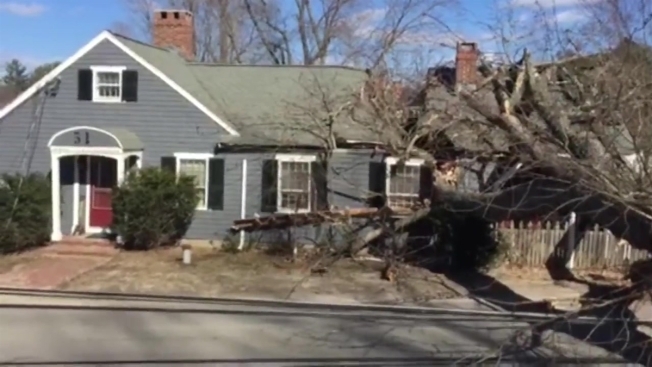 NBC Boston reporter Eli Rosenberg details how a tree fell and split a house in New Boston, New Hampshire. 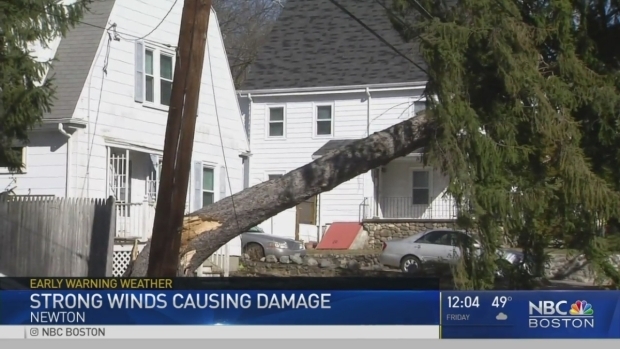 High winds are taking down trees and wires around New Hampshire and Massachusetts Thursday as much of southern New England is under a wind advisory. Police departments across eastern Massachusetts and southern New Hampshire are reporting trees have fallen across roads, including a tree that blocked part of I-93 in Salem, Massachusetts and a tree across an I-93 northbound exit in Salem, New Hampshire. Firefighters in Salem, Massachusetts also confirmed a tree fell onto a home on Dalton Parkway; however, the tree didn't break through the home's roof. No one was injured. Several roads were closed in Newton as crews responded to fallen trees and downed or hazardous wires, including a commercial stretch of Needham Street between Winchester and Christina/Oak streets. In Billerica, a car hit a fallen tree on Route 3 southbound near Treble Cove Road. No one was injured, according to state police. In New Hampshire, a tree fell on a Milford mobile home, according to National Weather Service reports. Trees have also taken down power lines in towns around Massachusetts. It's unclear how many are without power. Wind gusts are expected to reach into the 40-50 mph range by Thursday afternoon, but will taper off after sunset. Stay with us as this story develops.